Pictured above are the biceps muscles. Both of them pull your lower arm toward your shoulder. 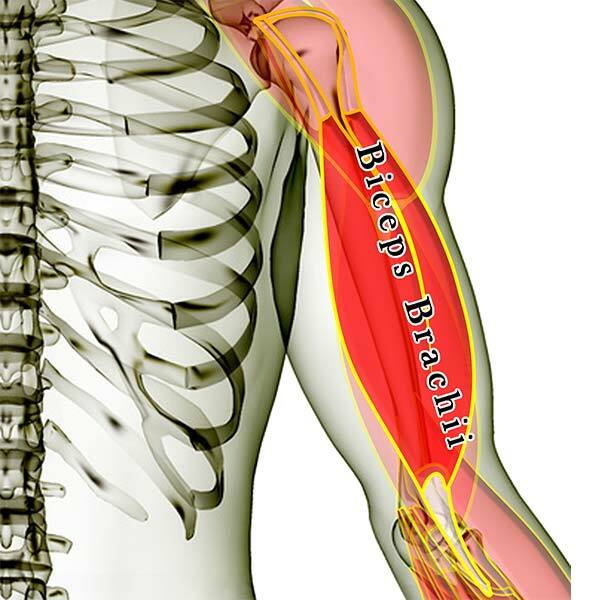 The biceps brachii rotates your lower arm as it flexes your elbow. The deeper of the two biceps muscles (the brachialis) is responsible for 'true flexion' of your elbow, and is involved in EVERY action you do that requires your elbow joint. The muscles are layered, showing how some of the muscles are covered by the others. All of the muscles are see-through so that you can appreciate the location and size of each muscle relative to the others. Click here for a list of all the muscles. Click here to see the shoulder muscles as a group. Click here to see the biceps muscles as a group. The following muscles cross the elbow joint and attach to the shoulder blade (scapula) & the arm (radius or ulna), to the upper arm (humerus) & the arm (radius or ulna). Click the appropriate link for your interest. Good luck working out those tight knots. If you have any questions, please post a comment. We try to respond within 24 hours. We're here to help you get more out of your training! © Copyright Alexander Method 2019. All rights reserved.